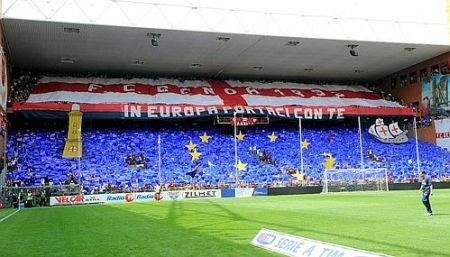 Thursdaynight at 21.05 hours Genoa plays the second match in group B of Europa League in and against Valencia. Our red and blue boys get the support of 3.000 fans in the orange-city of Spain. Genoa-fans in and around Amsterdam can watch the match in the Satellite Sportscafé in the city-centre of Amsterdam (Leidseplein, next to Bulldog). With so many matches in such a short period nobody expects you to win them all. After the 2-2 draw in the battle against Juventus last Thursday it was clear that it would be difficult in Udine today. Till the 81st minute Udinese and Genoa were equal unless the fact that Genoa “lost” Biava and Criscito with injuries during the match. In the first minute of the 2nd half Genoa deserved a penalty when Domizzi touched the bal with his hand inside the penaltyarea and referee Trefoloni whistled and decided to give us only a freekick outside the penaltyarea. 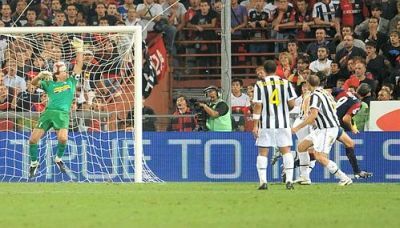 In the 81st minute happened we alle were frightened for: topscorer Antonio di Natale scored the openinggoal: 1-0. Of course Genoa tried everything to score the equalizer, but the 2nd goal was made in the 89th minute by Pepe of Udinese. Genoa is now on the 6th position of the standings with 10 points in 6 matches. Next week we play in Bologna, but first Thursdaynight in Valencia. Also the 3rd homematch of Genoa was very spectacular with many goals and attractive football. After the victories against Roma (3-2) and Napoli (4-1) this time we draw with 2-2 against Juventus that lost their first points in Luigi Ferraris. After 6 minutes Iaquinta scored the openinggoal: 0-1. In the 31st minute it was a header of Mesto out of a fantastic cross of Sculli that beat Buffon for the first time tonight: 1-1. In the last 15 minutes of the match both team scored another time: first it was Hernan Crespo who headed a cross of Mesto into the 7 of the goal and 5 minutes before the end Trezeguet scored the equalizer: 2-2. Genoa stays on the 4th position in the standings with 10 points in 5 matches. The next match is Sunday at 15.00 hours in Udine. Luigi Ferraris will be almost completely sold out with 24.289 seasonticket-holders and over 8.000 owners of a single ticket! This afternoon Genoa lost the first points in Serie A this season. Within 7 minutes Chievo Verona scored twice against our team without line-up players Moretti, Criscito, Juric, Zapater, Rossi and Sculli. Because we missed these 6 important players our defense and midfield were not good organized. Unless the ball-possession of 70% against 30% the match was played in the first 7 minutes. In the 65th minute the hope came back with the goal of Floccari (penalty), but 11 minutes later the match was definitively over when Pellissier headed 3-1 behind Amelia. In the 92nd minute Floccari missed an undeserved penalty, game over ! Already next Thursday we can have our revanche against Juventus. Also in Europa League our Genoa is on top of the standings. Tonight the Gasperini-boys beat Slavia Praha by 2-0, while the other match in poule B: Lille-Valencia ended in a 1-1 draw. On Thursday 1st October the next round takes place with: Valencia-Genoa.